Feng shui gem trees also called feng shui crystal trees, are a popular cure in the traditional feng shui school applications. These crystal trees are used in a variety of applications — from feng shui cures for love to feng shui for money. The first thing to notice is the use of specific crystals in a tree because each gem tree will usually come with one, and sometimes several types of crystals, which will define its feng shui application. 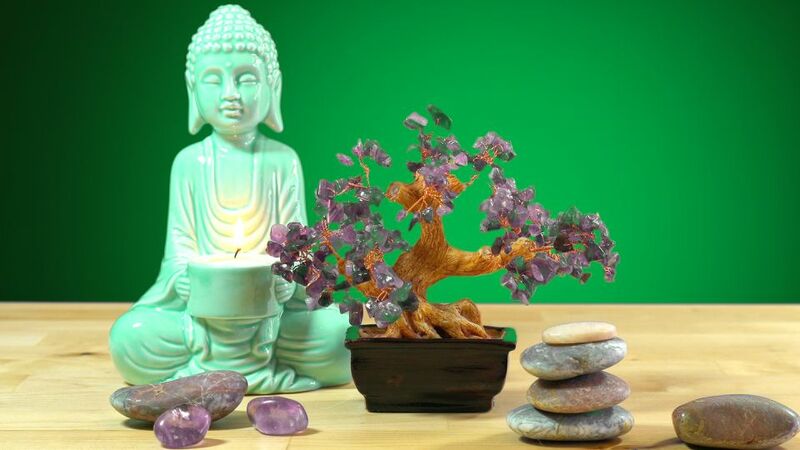 There is a wide variety of feng shui gem trees on the market, from amethyst gem trees to agate trees and even pearl, rose quartz, and coral trees. For example, citrine is a stone used for wealth and abundance purposes in feng shui, so a citrine tree will be used in your money area, which is the Southeast area of your bagua (if you are working with the Classical bagua). In the BTB/Western bagua your money area is in the upper left of your home or office. A jade gem tree can be used as a feng shui cure for health in your health and family area. A rose quartz tree is obviously all about one's heart, so it can be used as love and romance feng shui cure in the love and marriage area of your bagua. Sometimes you will come across a colorfully mixed gem tree that displays a variety of bright crystals; this can be an excellent feng shui cure for your Children and Creativity bagua area. Swarovski crystals are very pretty, but they do not have a strong feng shui energy because they are not 100% natural crystals (they have lead added to them). The best feng shui gem trees are made from natural/untreated rock crystals because they bring a stronger quality of energy. If you want, you can sure add some Swarovski crystals to your feng shui gem tree for a bit of sparkle and shine! However, a whole gem tree made only with Swarovski crystals will not have enough potent energy to be used as a specific feng shui cure. As to the number and the shape of crystals on the tree, the more crystals, the better! After all, the tree symbolizes stability, growth, as well as a long life blessed with abundance. There is no specific number of leaves or fruits on a tree, so there is definitely no feng shui requirement as to the number of crystals on a gem tree used as a feng shui cure. The same principle applies to the shape of crystals on the tree — they can be any shape — but more often than not, these trees come with crystals in the shape of small chips. The idea of a gem tree is that in time you get more and more of what you focus upon; you grow a whole tree, so to speak, from planting the seed of your clear intent. The visual of a feng shui gem tree is one of plenty and abundance; like leaves on a tree, you just can't count all its crystals! Sometimes you will find feng shui gem trees with crystals in shape of fruits or flowers. The symbology of specific fruits or flowers will add more meaning to the tree, as well as guide you to its best use. For example, apples are the feng shui symbol of peaceful energy, peaches are used as a symbol of good health, while peony flowers express the energy of sweet and sensual love. To make your gem tree more potent as a feng shui cure, you can add some enhancements to it. Chinese coins are often added to a gem tree to amplify its energy as a feng shui cure for wealth and abundance. In this case, auspicious feng shui numbers are used, such as 8 or 9 Chinese coins. When choosing a gem tree for your home or office, be guided by your own feelings as it is important that you like the colors, the crystals, as well as the overall arrangement of the crystal tree. Be sure this cure will look good and appropriate in its intended place, and of course, do not forget to take good care of it! Buying a feng shui cure, placing it in a specific spot in your home or office, and then forgetting all about it and letting it accumulate dust is just not good feng shui. What Are Good Feng Shui Cure Gifts? What Is the Feng Shui Use of Bamboo Flutes? What is the Best Way To Use Mirrors for Good Feng Shui in Your Home? How Do You Use Peach Blossom Luck Feng Shui Cure To Attract Love? How Is Lapis Lazuli Used in Feng Shui? 20 Fabulous Feng Shui Altar Photos, Get Inspired! Can Feng Shui Help Me Plan My Wedding?